If you've enrolled your child or yourself into hockey, basketball, baseball, lacrosse, soccer, self defense or any contact sport or activity, you have undoubtedly created a list of safety equipment you will need. If a mouth guard isn't on your list of equipment, ADD IT NOW! Your child should be protected from a young age to avoid tooth loss and other oral injuries. As for reasons to protect your mouth, simply take a look at any nostalgic photos of the old time hockey players, have a good laugh at the field goal style teeth... and get a mouth guard. While over the counter mouth guards are available and offer some protection, we suggest speaking to Dr. Branco about a custom fitted mouth guard. A professionally created mouth guard will protect the teeth, gums and bone structure by molding properly during use. Over the counter versions may prevent chipped or damaged teeth, but are not made to protect the important structures that support the teeth. 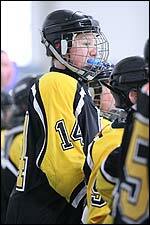 Dr. Branco can create mouth guards for you and your child ensuring that your activities are safer for your smile.